My Opinion: 6.8 || Weighty subject matter presented with directness and limited theatricality. The story’s major developments are easy to anticipate, but it’s an engaging film, with strong sense of place and rich detail. SYNOPSIS (Courtesy of Netflix): This high seas drama tells the story of Baye Laye, the Senegalese captain of a pirogue, or flat-bottom boat, often used to smuggle refugees to Europe. After he agrees to shepherd a boatload of people to Spain, a storm turns the trip into a nightmare. Strengths and Weaknesses: Director Moussa Touré employs a style that steers clear (so to speak) of artifice and survival-story tropes. Although Touré does nothing to simulate the appearance of a documentary, the movie has a plain, just-the-facts style that often suggests a documentary more than a typical lost-at-sea adventure. That being said, the narrative arc is hardly surprising, and the last quarter comes off flat — as if Touré has already finished what he set out to do and just needs to get it wrapped up. Essentially, the film’s admirable plainness comes at the cost of visceral engagement. We care but aren’t emotionally enthralled. That may represent a missed opportunity, but plot-driven adventures that nail the expected story beats are not exactly hard to come by. 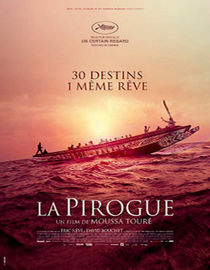 What’s more rare and more valuable is what Touré delivers in La Pirogue: the revealing depiction of frequently overlooked lives and experiences. A perfect film would have provided both insight and the thrilling engagement, but what we get here is important and gratifying. Characters/Performances: Many characters, small boat, short run time — given those constraints, Touré succeeds in defining a wide range of characters without distilling them to “types”. The protagonist Baye is a fairly standard good-guy-in-a-bad-situation, but Souleymane Seye Ndiaye brings a strong and believable presence to the role. Credible performances across the board, with many of the smaller parts being filled by actors who bring a non-professional (or so it seems) naturalness. Best Moment: Raging storms are a staple of seafaring adventures, but Touré handles this one with great aplomb, particularly given the presumably small budget. As with the rest of the film, it’s not an exercise in thrills but in verisimilitude — we feel the characters’ sense of being battered and disoriented and tilting toward oblivion.